The Verkhovna Rada of Ukraine has supported the bill on Donbas reintegration and the recognition of Russia as an aggressor state. The draft law determines that the Russian Federation's temporary occupation of territories in Donetsk and Luhansk regions is an illegitimate act and does not create any territorial rights for the Russian Federation. The activities of the Russian armed forces and other military formations and the occupational administration of the Russian Federation, which is contrary to the norms of international humanitarian law, is deemed illegal, and any act issued in connection with such activity shall be invalid and shall not create legal consequences, the Bill says. Read alsoTurchynov says Donbas, Crimea issues may be united in single billAccording to the draft law, the temporary territories in Donetsk and Luhansk regions include the following: the land territory and internal waters within separate districts, cities, settlements and villages of the regions where the military forces and the occupation administration of the Russian Federation have established and are exercising occupation authority and general control of the Russian Federation; internal sea waters and the territorial sea of Ukraine adjacent to the land territory specified in paragraph 1 of this part; the airspace over the territories specified in paragraphs 1 and 2 of this part. The boundaries of the temporarily occupied territories in Donetsk and Luhansk regions are determined upon submission of the General Staff of the Armed Forces of Ukraine by the Ministry of Defense of Ukraine. The bill states that the purpose of the state policy on ensuring the state sovereignty of Ukraine over the temporarily occupied territories in Donetsk and Luhansk regions is, in particular, the liberation of said territories and the restoration of the constitutional order there; as well as the protection of the rights, freedoms and legitimate interests of the Russian aggression. Read alsoScenario for returning Donbas by force could entail up to 12,000 in casualties in 10 days – Chief of Gen. StaffIn order to ensure Ukraine’s state sovereignty in the temporarily occupied areas of Donetsk and Luhansk regions, the state bodies take political, diplomatic, and other measures to restore the territorial integrity of Ukraine within the internationally recognized borders of Ukraine; take measures to ensure national security and defense, deter and repel Russian armed aggression in Donetsk and Luhansk regions; develop the defense and security capabilities of Ukraine by using, first and foremost, Ukraine's potential while maximizing the potential of international cooperation. In addition, it is determined that the state of Ukraine, territorial communities of villages, settlements, cities located in the temporarily occupied territories in Donetsk and Luhansk regions, state bodies, local self-government bodies and other subjects of public law, individuals, despite of the acquisition of status of internally displaced persons or other special legal status, and legal entities retain right of ownership and other real property rights, including for real estate and land plots, located in the temporarily occupied territories in Donetsk and Luhansk regions. Read alsoOSCE monitors report 26 tanks in Russian-occupied areas outside DonetskThe Cabinet of Ministers of Ukraine continuously monitors the state of human rights and freedoms and documents violations of such rights and freedoms in the temporarily occupied areas of Donetsk and Luhansk regions, publishing and providing relevant information to international human rights organizations, and takes necessary measures, in particular, generalizes the legal position and forms a consolidated claim by Ukraine against the Russian Federation to hold Russia responsible for its military aggression against Ukraine. The state of Ukraine is not responsible for the illegal actions of the Russian Federation as an aggressor state, its armed forces, other military formations and the occupation administration in the temporarily occupied territories in Donetsk and Luhansk regions, according to the Bill. It also said that in order to ensure national security and defense, deter and repel Russian aggression in Donetsk and Luhansk regions, the Armed Forces of Ukraine and other military formations shall be used, as well as the Ministry of Internal Affairs of Ukraine, the National Police of Ukraine, the central executive authority, which implements state policy in the field of civil protection. At the same time, the legal basis for deterring and repelling armed aggression of the Russian Federation and for the restoration of Ukraine’s territorial integrity is Article 51 of the UN Charter and the country’s national legislation. The leadership over the forces involved in the implementation of measures in question rests with the Joint Operational Headquarters of the Armed Forces of Ukraine, which, among other things, implements and directs, coordinates and controls the activities of military and civilian (military) administrations (in case they are set up) in Donetsk and Luhansk regions on matters of national security and defense. The procedure for the crossing of persons along the line of contact and movement of goods to/from the temporarily occupied territories in Donetsk and Luhansk regions shall be determined, taking into account the security situation, by the Chief of the Joint Operational HQ of the Armed Forces, in agreement with the Security Service of Ukraine (SBU) and the central executive body that forms and implements the state policy on temporarily occupied territories. Read alsoDonbas militants attack Ukraine 24 times in last day, employ heavy weaponsBy this draft law, the Verkhovna Rada, in accordance with paragraph 9 of part one of Article 85 of the Constitution of Ukraine, approves the decision of the President of Ukraine on the use of the Armed Forces and other military formations, adopted in accordance with paragraph 19 of part 1 of Article 106 of the Constitution, to deter and repel Russia's armed aggression in Donetsk and Luhansk regions and ensure Ukraine’s state sovereignty over temporarily occupied territories in Donbas. In addition, the bill amends a number of other laws, in particular, "On the Status of War Veterans, Guarantees of Their Social Protection" and "On Local Self-Governance in Ukraine". Amendments to the Law "On the Armed Forces of Ukraine" stipulate that the Armed Forces of Ukraine may be attracted to taking measures envisaged by the Law, including during peacetime, being entitled to use weapons and military equipment. The law will enter into force on the day of publication and will remain in force until the end of the special period announced in 2014. At this point it is determined that the law will be enforced 6 months after the completion of the Anti-Terrorist Operation, but no longer than for 3 years from the date of this law’s entry into force. Amendments to the Law "On the Legal Status of Martial Law" stipulate that once military administrations are set up in settlements, they take up all powers of military-civilian administrations of these settlements. Ahead of the Bill’s first reading, all provisions mentioning the Minsk Agreements on Donbas settlement have been removed from its initial text. As UNIAN reported earlier, on October 4, the Verkhovna Rada registered presidential draft law No. 7163 on the specifics of the state policy regarding the state sovereignty of Ukraine over the temporarily occupied territories in Donetsk and Luhansk regions. 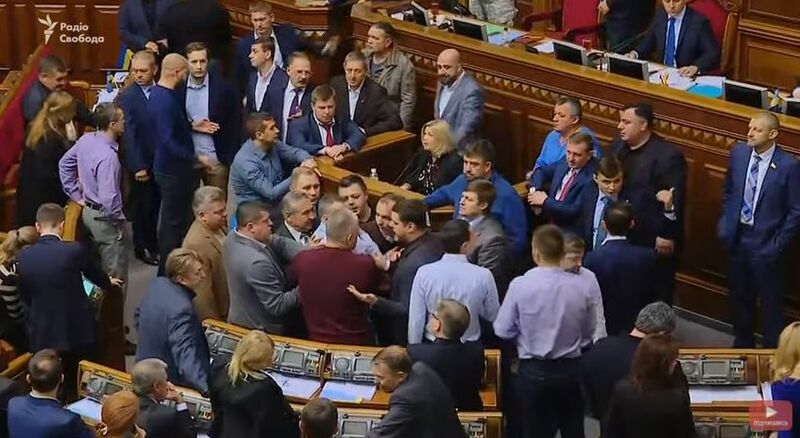 A brawl erupted in front of the Parliament rostrum as Rada Speaker Andriy Parubiy was putting the bill to vote.